The European Union could force Microsoft to delay the launch of Windows Vista in Europe due to anti-trust actions. The features under fire are Internet searching and document features. I don’t exactly know what they mean by “document features”, but knowing the European Commission, probably the ability to open text-file documents is monopolistic. When January comes, I think Microsoft should just ship this instead of Windows Vista to Europe. And let productivity in the European economy be the judge of what features an operating system are allowed to have. lol! dude that’s dark, but so true. why don’t they put un-style ‘sanctions’ on apple? hell, they might sell pcs, but they come bundled with EVERYTHING! I live in Europe and I like those law, because we use linux a lot in goverment & some org. @Karolis: Just cause you use Linux or Mac OS X, doesn’t mean you have to punish Microsoft for it. I also live in the EU and I think that these laws are so crazy. It’s only Microsoft they are after – others can do as they please (look at the way you select the default browser in Mac OS X – you have to do that in Safari). 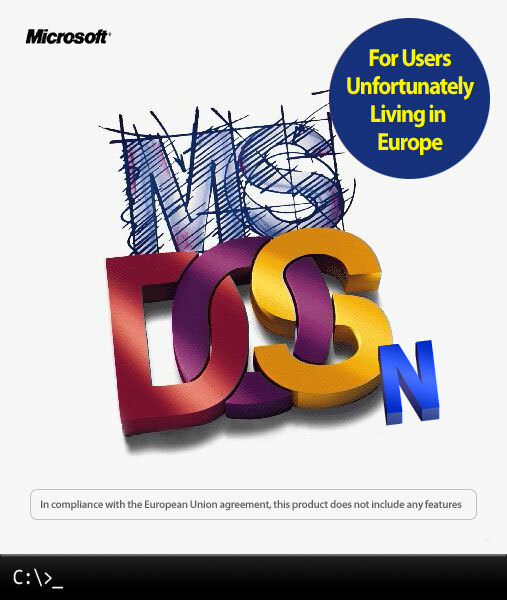 But someone in the European commission clearly has a grudge against Microsoft and unfortunately also the power to make Microsoft make a version of Windows without media player that no one actually buys. Regarding media player in Windows I don’t really see what the problem is. If I want to use iTunes I am perfectly able to do that. I’ll just install iTunes and let it associate itself with the file types it supports and I will se media player no more – except when I open a windows media file (and then I could just install another player to handle those as well). What’s the problem? This is really just another example of how crazy the EU is. @Asbjørn: I agree with you completely. The United States does have similar laws that have caused lawsuits with MS in the past, most of which ended up without basis, and were therefore disregarded. EU is a good concept, but alas, poorly executed primarilly due to the morons that are given too much power to run the thing.. mainly EC. LOL Ok this is funny but VERY true, the European Commission seems to be only interested in Microsoft’s money and not really in the consumer, come on look at Windows XP N no sales at all, yet they insist and persist why ah?. Your post is childish. You should really respect the decision of the EU. It’s good to see somebody at least trying to do something before it’s too late _again_ (Intenet Explorer / Windows Media Player / Office etc.pp). There must indeed be a way for security companys to fully and completely integrate there products like MS is able to, and this is, afaik, not the case atm. This results in another market destroyed by Microsoft monopoly. @ekla: Have a look at what an iMac comes with. Sorry, Mac OS X is a good positive-comparison. Most of the insides of Mac OS X are opensource and the overall unix-structure provides companies with every aspect of fully integrating their products into the system. Microsoft, in contrast, was successfully sued many times for using this advantage for their products alone, leaving others to ‘hack’/reengineer protocols/interfaces. Now the same happens again, but worse. @ekla: What browser do you use on Windows? Let me guess. Firefox or Opera. Is that choice? What music player, iTunes? Choice? Mac OS X is not open-source. It’s APIs may be better documented than Windows, but it certainly does not allow anyone to change the code. internals to develop their applications – fair competition, no chains. The problem is, that the average user even does not have a choice what operating system he gets with a new PC. 98%(subjective value) of all PCs for personal use come with Windows(+Works +Word) preinstalled because it practically costs an OEM nothing. And since the vast majority of these people is not like you and me, technically interested with some years experience in IT, they are happy if this thing just works. These people have no choice because they usually do not know alternatives or fear changing something in their computers. These people are in focus. I am more than happy that politics finally approches this problem early, even if it is just to get media attention and the problem into focus. I would be much more worried if there were no concerns. And, if you buy a mac, you already made a choice, choosing something different. Interesting that you deleted my last comment. It seems that you did not like the content … And this simply disqualifies you as non objective. But simply reading your website is enough to discover this.